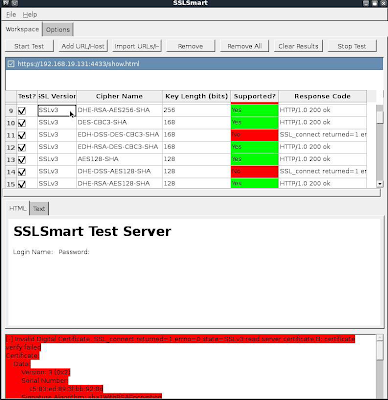 SSLSmart is a highly flexible and interactive tool aimed at improving efficiency and reducing the false positives during SSL testing. Among other things, SSLSmart simply an advanced and highly flexible Ruby based smart SSL cipher enumeration tool. It is an open source, cross platform, free tool. It was programmed because a number of tools on the Windows platform allow users to test for supported SSL ciphers suites, but most only provide testers with a fixed set of cipher suites. Further testing is performed by initiating an SSL socket connection with one cipher suite at a time, an inefficient approach that leads to false positives and often does not provide a clear picture of the true vulnerability of the server. SSLSmart is designed to combat these shortcomings. Content Scan (default): Exact server response can be seen in HTML and Text forms for each cipher suite selected for the test URL. Basically, it shows various server error messages received for weak cipher suites from live systems.